Bangladesh is situated in north eastern part of South Asia between 20° 34' and 26° 38' north latitude and between 88° 01' and 92° 41' east longitude. It lies in the active delta of three major rivers viz Padma, Meghna and Jamuna and their numerous tributaries. The country covers an area of 1, 47,570 sq.km and bounded by India from the west, north and most of east. Myanmar lies on the southeastern edge and Bay of Bengal on the south. Small tracts of higher land occur in Sylhet, Mymensingh, Chittagong, Cox’s Bazar and Chittagong Hill Tracts (CHT) regions. The southwestern region consists of a large number of dead and Cut-off Rivers. The coastal part of Bangladesh includes the famous Sundarbans Mangrove Forest. A number of depressed basins are found in the district of greater Mymensingh and Sylhet which are inundated by fresh water during the monsoon that gradually dry out during the dry winter season. These depressed basins are known as ‘Haor’. Climate of Bangladesh is sub-tropical and monsoon rainfall varies from 1200-3500mm. Rice is the major cereal crop while jute, sugarcane, and tea are the main cash crops. Other important crops are wheat, tobacco, pulses, vegetable and tree fruits. Garments, raw and manufactured jute goods, tea, fish, and, hides and skins are the chief exports. Bangladesh is noted for its estuarine environment, yet less than 10% of its total water flow originates from its own catchments and rest comes from India, Nepal and Bhutan. Normally, 20% of the country gets flooded during the monsoon period. 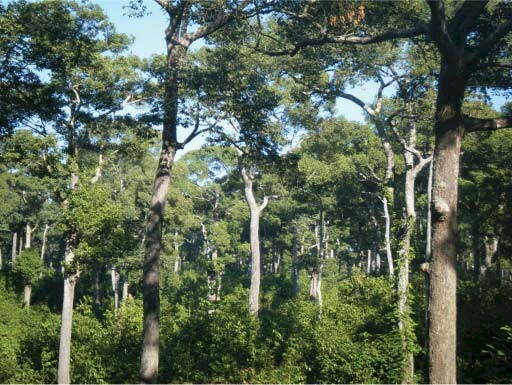 Forestry is considered as a sub-sector of Agriculture in Bangladesh. Forests Department controls an area of about 1.60 million hectares. Out of this forestland, 0.20 million hectares fall under artificial coastal plantation established in the coastal region. In addition, about 0.77 million hectares of land has tree coverage in the homestead and marginal unused fallow land throughout the country. District administrations in Sylhet, Chittagong and Chittagong hill districts control 0.67 million ha. of Unclassified State Forests. The largest single tract of natural mangrove forest is the Sundarban. It consists of a total of 6,01,700 hectare which is 4.07% of total land mass of the country and 40% of total forest land. Sundarban harbours 334 species of trees, shrubs and epiphytes and 375 species of wild animals including Royal Bengal Tiger, Crocodile and Dolphin and 291 species of fishes. 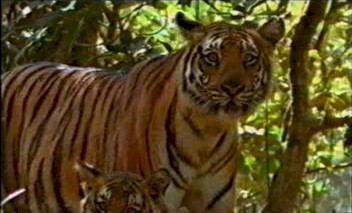 World renowned Royal Bengal Tiger is the magnificent animal of the Sundarban. 1,39,700 hectare forest land of Sundarban is declared as World Heritage Site where three wildlife sanctuaries viz.Sundarban East, Sundarban West and Sundarban South wildlife sanctuaries are located. Sundri is the most important tree species in the Sundarban which is distributed over 73% of the reserve. Extent of Sundri is followed by Gewa (Excoecaria agallocha), Baen (Avecinnia offcecinalis), Passur (Xylocarpur mekongensis), Keora (Sonneratia apetala) etc. There are some other non-wood forest products like Golpata (Nypa fruticans), honey, wax, fish, crab etc which are also of high value. Sundarban is a unique habitat for a number of wildlife. Among them some mammals are Bengal Tiger (Panthera tigris tigris), Gangetic Dolphin (Platanista gangetica), Monkey (Macaca mulatta), Indian Fishing cat (Felis viverrina), Indian Otter (Lutra perspicillata), Spotted Deer (Axis axis) etc. Reptiles like Estuarine Crocodile (Crocodylus porosus), Monitor Lizard (Varanus salvator), Rock Python (Python molurus) and Green Turtle (Chelonia mydas) etc. are found in the Sundarban. 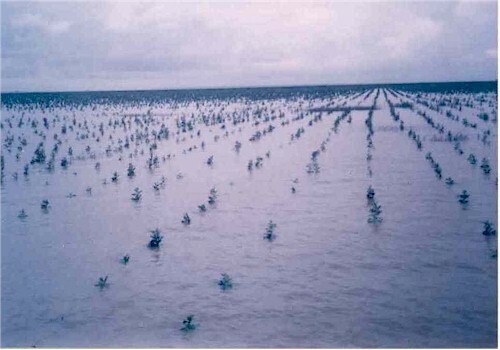 Mangrove afforestation along the entire southern coastal frontier is an innovation of foresters. During 1960-61, Government undertook afforestation programme along the shore land of coastal districts. This initiative got momentum from 1980-81 with the aid of development partners and afforestation programs are extended over foreshore islands, embankments and along the open coasts. The present net area of mangrove plantation is 136,000 hectare after return back some area to Ministry of Land, and losing some area due to natural calamities. 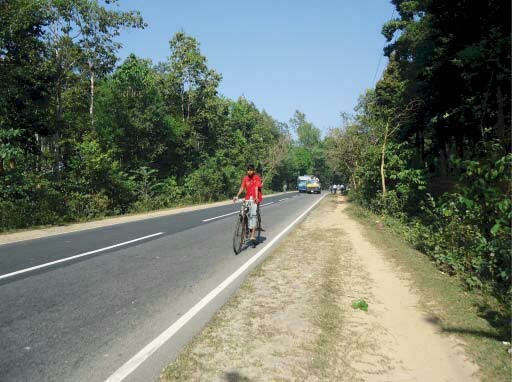 Tropical evergreen and semi evergreen forests are extended over Chittagong, Cox’s Bazar, Chittagong Hill Tracts and Sylhet totaling an area of 6,70,000 hectare which is 4.54% of total landmass of the country and 44% of national forest land. Depending on topography, soil and climate, these areas are categorized as i) Tropical wet evergreen forests and ii) Tropical semi-evergreen forests. The hill forests are abundant with numerous plant as well as animal species. Some important flora are Garjan (Dipterocarpus spp. ), Chapalish (Artocarpus chaplasha), Telsur (Hopea odorata), Tali (Palaquium polyanthrum), Kamdeb (Callophyllum polyanthum), Uriam (Mangifera sylvatica), Jarul (Legarstromia speciosa), Civit (Swintonia floribunda), Toon (Cedrela toona), Bandorhola (Duabanga grandiflora) etc. Moreover there are bamboo, cane, climbers and fern etc. in these forests. These forests are brought under plantation programme since 1871. At present, plantation activities are being conducted under development projects. Some valuable plantation species are Teak (Tectona grandis), Gamar (Gmelina arborea), Mehogani (Swietenia spp), Chapalish (Artocarpus chaplasha), Jarul (Legarstromia speciosa), Koroi (Albizzia spp), Chikrassi (Chikrassia tabularis), Pynkado (Xylia dolabriformis), Kadam (Anthocephalus cadamba), Telsur (Hopea odorata) etc. Among the mammals Elephant (Elephas maximus), monkey (Macaca mulatta), Wild Boar (Sus scrofa), Barking Deer ( Muntiacus muntjak), Samvar (Cervus unicolor), and Indian Leopard (Panthera pardus). Among the reptiles King cobra (Ophiophagus hanna) Monitor Lizard (Varanus salvator) and Bengal Monitor Lizard (Varanus bengalensis) are remarkable. The Central and northern districts covering an area of 1,20,000 ha about 0.81% of total land mass of the country and 7.8% of the country’s forest land are bestowed with Tropical Moist Deciduous Forests. This forest is intermingled with the neighbouring settlements and fragmented into smaller patches. Sal (Shorea robusta) is the main species there with other associates like Koroi (Albizzia procera), Azuli (Dillenia pentagyna), Sonalu (Cassia fistula), Bohera (Terminalia belerica), Haritaki (Terminalia chebula), Kanchan (Bauhinia acuminata), Jarul (Lagerstroemia speciosa), Jam (Syzygium spp) etc. Presently, participatory forestry programme are being implemented here under the social forestry initiatives. Among the mammals, Jackel (Canis aureus), Monkey (Macaca mulatta), Wild cat (Felis chaus) etc. are found there and among the reptiles Bengal Monitor Lizard (Varanus bengalensis) and common cobra are remarkable. Tree coverage in the village forests are 0.77 million hectare which acts as the source of a remarkable portion of national demand of forest produces. The latest inventory conducted in 2005-2007 exhibits that almost 50% of total gross volume are available in this village forests. Social Forestry programs have been initiated with a view to meet the forest product requirements of local population and to reverse the process of ecological and climatic degradation through proper soil and water conservation and to improve the socio economic condition of the rural people. From last three decades there has been a gradual shift in the forest management approach adapted by Forest Department i.e. from its traditional custodian role to a more participatory approach. Accordingly the provision of people’s participation in protecting the natural forest and afforesting the degraded and encroached forest land with benefit sharing mechanism has been developed and people’s participation has been ensured. In Protected Areas Co-management model has been introduced recently. The latest inventory also exhibits that the total gross volume is 212 million m3 and the total commercial volume is 150 million m3 (excluding the volume of mangrove plantation). Almost 50% of the total gross volume, and more than 50% of the total commercial volume, can be found in villages. Approximately one-third of the gross volume, and less than 30% of the commercial volume, is found in Forests. Responsibility for forestry was passed to the Bangladesh Forest Department, under the Ministry of Environment and Forests, after the independence of Bangladesh in 1971. Forest Department has multi-dimensional functions of forest resource conservation and management, protection and management of biodiversity and watersheds along with economic and ecological development of the country. At present there are 10167 posts, with Chief Conservator of Forests as head of the Department. Established in 1979. Administered by an officer in the rank of a Deputy Conservator of Forest, who is designated as Director of the institute. The center conducts training Courses for the forest staffs, BFIDC staffs, saw mill employees and NGO staffs. Moreover, Forestry curriculum has been introduced in few public Universities, since late 1970s. The Forestry sub sector contributes little over 1.5% of the total GDP (Gross domestic product) of Bangladesh. This does not reflect the real contribution of this forestry sector. The rural population uses fuel wood and other minor forest products which are not counted in the GDP. Social Forestry contributes significantly in poverty reduction. This sector has considerable contribution to the poverty reduction in the country especially through the social forestry programme. Under the social forestry programme about Tk. 1530.00 million was distributed among 88 thousand no. of participants as part of their benefit share and a fund of Tk 290.00 million has been created as Tree Farming Fund (TFF) for subsequent plantation. About 2% of the total manpower of the country is engaged in the forestry sector. Many people actually benefited directly from forestry-related activities e.g. in wood based industry, saw milling, furniture making, establishing private nursery, logging, extraction and in the afforestation programs. Besides this in Sundarban 0.5 millions of people are dependant on the mangrove forest for their livelihood (e.g mawali, bawali, fisherman etc). Forests supplies bamboo, rattan, murta, golpata, honey, herbal species etc. Forest supplies bamboo for industries (paper mills) and for rural construction. Mangrove forests of Bangladesh are a home of estuarine fishes, shrimps and crabs. There are about 10,000 m tons of fish is collected from the Sundarbans reserved forest annually. The coastal mangrove forests (Sundarbans, coastal plantation) plays an important role in the reclamation of land, protection of coastal habitats from cyclones and tidal surges and to uplift the socio-economic conditions of coastal people. Bangladesh is well known to be the pioneer of innovative coastal afforestation technology in the world which was started in the late sixties. The trees and plants in general affect the hydrological cycle by intercepting precipitation by canopy, reduce runoff, and increase infiltration of water. The biggest challenge for the forestry sector is to sustain environmental services of forests while meeting demand of future timber, fuel wood, fiber and myriads of other forest produce for an ever increasing population in the face of rapidly shrinking forest areas. This calls for horizontal as well vertical expansion for forestry sector in Bangladesh. The current inadequate human resources and logistics and knowledge management capacity of Forest Department has to improved substantially to address the needed intervention in the forestry sector to meet the growing demand of the nation. This will also call for updating the forest act and policy and other rules & regulation to meet the demand of the present and future generations. Assistant Chief Conservator, Forest Department, Bon Bhaban, Agargaon, Dhaka-1207, Bangladesh.